Perth and Kinross region is known as highland Perthshire and the gateway to the Scottish Highlands. The region offers a number of activities including walking, gorge walking, white water rafting, pony trekking and many more. Places to visit and towns in Perthshire include Aberfeldy, Loch Tay, Auchterarder, Gleneagles, Dunkeld and Birnam. Most of the region is little more than one hour by road or rail from Glasgow or Edinburgh. In 2014, Gleneagles golf resort played host to the 40th Ryder Cup, as it returned to Scotland- the ‘home of golf’. The 2014 Ryder Cup competition was fierce between the European and American teams. We offer unique self catering accommodation on a working farm in the heart of the West Highlands, between Crianlarich and Tyndrum. Situated within Loch Lomond and the Trossachs National Park. Can sleep up to 5 guests. Suitable for families. 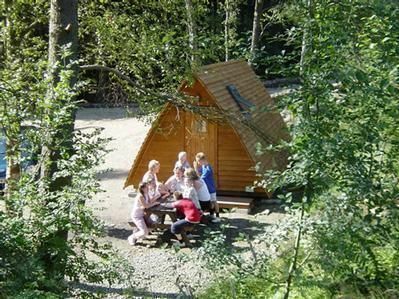 Click here for more information on Strathfillan Wigwams. Please just click on the links below for the full range of holiday accommodation, from high quality hotels near Perth and Kinross, to nearby Perth and Kinross B&Bs and guest houses. There are also a good range of self-catering cottages around Perth and Kinross. There is a wide range of attractions, places to eat and other activities to suit all tastes in and around Perth and Kinross. Lovetoescape.com aims to provide a one-stop shop for holiday makers by providing easy an easy to use directory and information portal for all types of holiday accommodation and attractions in the UK. If you would like to advertise your Perth and Kinross attraction, Hotel, Perth and Kinross cottage, or B&B in Perth and Kinross, please take a look at our advertising options. Former crowning place of the Kings of Scotland, stunning setting in beautiful grounds. A stately home to visit.